Friendly, Calm, Confident and capable. Mark is excellent; I always feel safe and the results are fantastic. A dental implant is a replacement for the root of your tooth. 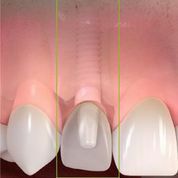 The image shows how different parts of a dental implant and ceramic crown are used to replace the natural parts of a missing tooth. A dental implant provides the perfect solution to replace a missing or many missing teeth. 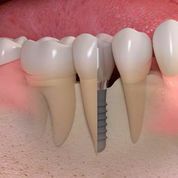 Once placed, the implant can provide a platform on which to build. It can then help support the visible part of the tooth that you can see. For example, it can hold a new crown, part of a fixed bridge or removable denture. Dental implants are made of biocompatible titanium. The surface of the implant has been specially treated and roughened to allow your own bone cells to grow onto the implant, fixing it to the bone, so that the implant becomes rock solid. This process is called osseo-integration. 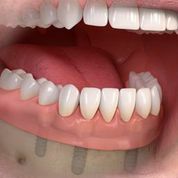 Dental implants were first used over 30 years ago. There is now a wealth of clinical research to show that dental implants can provide the best long term solution to missing teeth. If you are a member of our dental care plan and you have an emergency when you are away from home please call 0800 783 2337. Copyright © Fellows Dental Practice. All rights reserved.